If ever there was a film star to look up to, it would be Katharine Hepburn. Doing things on her own terms and refusing to play the Hollywood game. Her parents encouraged her to speak her mind which paid off in her adult life. Growing up a tomboy, she was never going to be your typical Hollywood actress. Discovering her talents in college stage productions, Katherine continued her acting with getting small roles on Broadway. Eventually landing success in ‘A Warrior’s Husband’ (1932), the film role offers followed. Stories of Katharine began to circulate about her off screen behavior. In a complete contrast to actresses of the time, she never wore make-up, never posed for photographs or gave interviews and always wore slacks. At this time, actresses were never seen in trousers, maybe playing up to their glamorous profession. The entrance to the Katharine Hepburn exhibition at the New York Public Library began with a display of her slacks. She gave up on skirts and dresses early, feeling they did nothing for her athletic figure. Preferring a high waist and full leg, it highlighted her slim waist and hid her thin legs. She knew what worked for her and had no fear in telling the films’ costume designers. She worked with the designers as a collaborative. Hepburn would have designs she created as well as giving opinions on how best to exaggerate her assets (like a 20″ waist) and hide what she didn’t like (her slim legs). Katharine believed costume was an important element in getting into character, hence her heavy involvement. She also made amusing little water colours of herself in character complete with the characters expressions. She said it helped her get a sense of the personality. 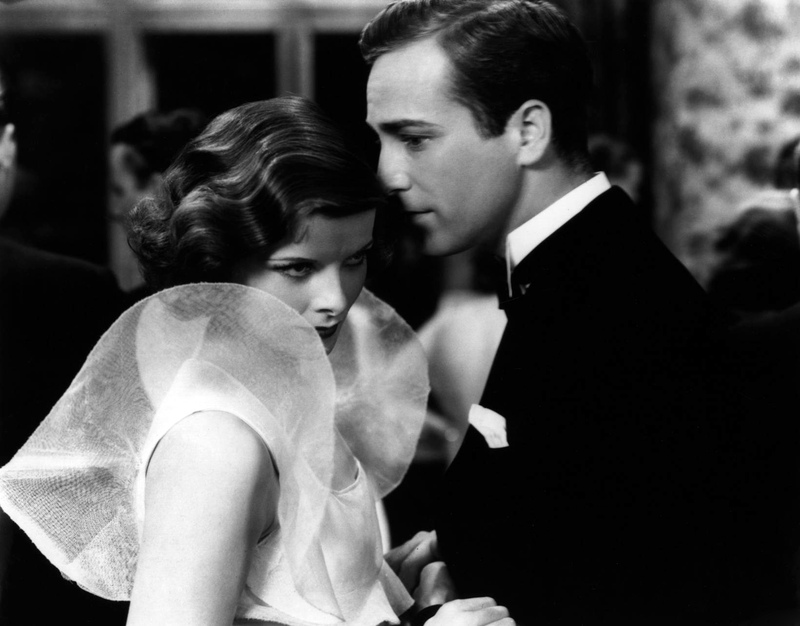 After a bad run of films, she returned to the stage and was a hit again in ‘The Philadelphia Story’. Buying the film rights, she negotiated her way back into the film industry on her own terms. A film version of the stage play was a hit and earned an Oscar nomination. She was hot property again and continued with more film successes. She starred with Spencer Tracy in eight films and off screen their romance lasted 25 years. Devoting her time to her ailing partner Spencer Tracy, the film roles were less frequent. After he died, she kept a smaller workload but still garnered Oscar nominations. In 1969, Hepburn was the lead role in Coco, a musical about Coco Chanel, a musical I think is ripe for a revival (especially after the success of Coco After Chanel). It won three Tony’s and six Tony niminations, including one for Hepburn’s performance. The sketch above was of a costume for Coco, a black layered silk and chiffon gown wit black velvet polka dots which was a particular favourite. I’ll leave you with a very fashionable scene from the musical.